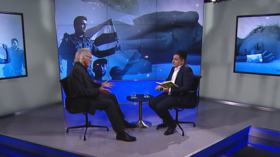 Journalist John Pilger has recapped major events and crises that unfolded across the globe this year in an interview to RT. “It’s been dug from a hole marked Cold War. It sounds like 1950,” the investigative journalist told RT’s Going Underground, apparently referring to the notorious CIA-led Operation Mockingbird which pursued similar aims. “But it’s sort of more serious now because it does tell us where so much journalism has gone,” he added. Posed as a charity fighting disinformation, the Integrity Initiative has been revealed to be conducting secret influence campaigns across Europe and working hand-in-glove with selected journalists to maintain high levels of anti-Russian sentiment within the mainstream media. This is what I call Vichy journalism. This is journalism of those who are going along with the state. According to Pilger, the Cold War doesn’t exist in the most of the world. “Most of the world doesn’t know what it is about. It exists in the enlightened centers of London and Washington, and perhaps in Berlin or Brussels,” the legendary journalist said. “Why isn’t the sufferings of Yemenis absolutely burned into the consciousness of the readers and viewers and listeners of Western media?” he wondered. Western states have been widely criticized by human rights groups for their continued arms sales to Riyadh. In November, Oxfam accused the US, UK, and French governments of being behind the starvation of 14 million people in Yemen because they are “supporting this war.” That’s about half Yemen’s population. Also more than 22 million out of Yemen’s population of 27 million are in need of humanitarian and security aid as a result of the Saudi-led blockade and bombardment. Commenting on the legacy of recently-deceased President George H.W. Bush, Pilger was quite categorical: “[He] was undoubtedly one of the leading great criminals of the time!” The investigative journalist recalled that while being a CIA director, Bush was overseeing the infamous Operation Condor, a US-backed campaign of political repression aimed at eradicating communists and leftists in the Southern Cone of South America. Bush’s political landscape during his presidency also wasn’t smooth as he ordered what is known as the First Gulf War.“There was no war, in fact, there was an enormous assault by overwhelming forces led by General [Norman] Schwarzkopf and of course President Bush in Iraq,” Pilger said. George H.W. Bush, the last Cold War-era US president, passed away December 1 at the age of 94.